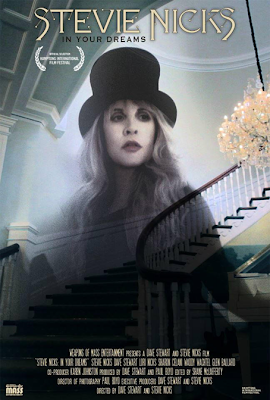 "In Your Dreams" Stevie Nicks Documentary In Theatres - April 2nd - ONE NIGHT ONLY! NEW YORK, March 11, 2013 /PRNewswire/ -- Following the tremendous positive response to the Stevie Nicks documentary "In Your Dreams", an intimate portrait of one of rock's most enduring and legendary artists, at the Hamptons International Film Festival and the Mill Valley Film Festival, this up close portrayal of Nicks recording her critically acclaimed "In Your Dreams" CD in collaboration with Dave Stewart is now scheduled to screen in over 50 theaters across North America on April 2nd. Tickets will be available on www.inyourdreamsmovie.com once they go on sale. A current schedule of cities and theaters follows this release, with more cities to be added. Nicks, one of the lead singers and emotional catalyst for Fleetwood Mac, is embarking on a world tour with them beginning April 4th in Columbus Ohio. A multi Grammy Award winning artist and Rock & Roll Hall of Fame inductee, Nicks allowed cameras inside her magical old mansion high atop the hills of LA with a wild cast of musicians and friends. The inner life of the legendary Nicks has by her design long been kept at a distance from the public. We learn in "Dreams" that her world features, costume parties, elaborate dinner feasts, tap dancing, fantasy creations and revealing songwriting and recording sessions all of which are captured on film. Also cameos by Edgar Allan Poe, Mick Fleetwood, Reese Witherspoon, a massive white stallion in the backyard, owls and naturally a few vampires who appear in several "home movie" style music videos. Along with tracking the Nicks/Stewart creative partnership, "In Your Dreams" has plenty of other cinematic payoffs including rare never before seen personal scrapbook stills from Nicks' childhood and family life, and a wealth of candid backstage and performance shots taken over the last 35 years. The documentary was produced by Dave Stewart's production company, Weapons of Mass Entertainment. Nicks, who has sold millions of records as a solo artist and writer of such iconic songs as "Landslide," "Gold Dust Woman" and "Edge of 17," is regularly cited by stars as diverse as Taylor Swift, Kid Rock, Courtney Love, Sheryl Crow, The Dixie Chicks and John Mayer as an iconic favorite and heroine and is a continuous inspiration to the world's top fashion designers. "She is really real. It doesn't matter if she is singing in the make-up room or in the middle of a TV interview. She is who she is, and she doesn't change," commented Stewart. "This is our baby and we give her lovingly into your dreams. From our tribe to yours," concluded Nicks. Oh well...Dave Stewart said it was "coming to DVD right after it finishes in cinemas." So there! Not too long now! They tweeted that more showings will be added. Don't give up hope yet! It actually says more cities to be added right in the press release. UK dates are expected as well. Oops, Winston-Salem is a city in NC and the Aperture is a very artsy-cinema. AND - IT'S ONLY 40 MIN AWAY FROM ME!!!!!!!!!!!!!!!!!!!!!!!!!!!!!!!!!!! I hope I can score tix! Oh, I had plans for April 15th in Toronto, but I think they just changed, and Stevie is now a part of them! Is this a tax write off for next year? Think about it, she'll be fortunate to have a total of 5,000 people attend the film, so maybe it will earn $50,000 - which will be red ink for the costs of production and screenings. She will earn millions with Fleetwood Mac on tour this year, and likely can show about$1 million in losses for the IYD documentary- i think it's business. I may see it again- I didn't like it much at The Hamptons but want to see if maybe it has been tweaked to add more in the studio filming, more minutes of songs and if they fix the horrid mistake of making the volume at the end of the movie of a final full song far too soft with cuts to Stevie's dog and idiotic 'Yorkie talking' sounds while Stevie was singing. Play that last song, loud, at very least. I don't have much hope that the doc has been re-edited, but one can hope. Dang, she talks sooo much. That's fine, but would love to see and hear more of the songs. 'Wide Sargasso' and 'Italian' got totally screwed. So, maybe i'll like it more the 2nd time, now that my expectations aren't high. Talk, talk, talk. But it IS SLN. So frickin' happy this is coming to Minneapolis! Hopefully a DVD/Blu-Ray release won't be far behind ... a wonderful addition to the Blu-Ray would be her 2011 Wiltern concert (a bonus disc edition) ... now that would really sell! I am hoping, when this comes to DVD/BR that the music videos are separated from the documentary. So excited for April 2nd! To the poster above you complains about Stevie talking too much - I have heard all these songs - I would much rather hear her talk. I could listen to her talk all day. I find her fascinating and love the cadence to her voice. I second that wholeheartedly---everything you wrote. Well, then you'll love the film. She does have some hilarious moments, some touching numbers. I never write well. Yes, of course she should talk in a documentary- but I wanted to see the album being made, talked about while being made. Nearly all of the speaking is after the cd is finished, and there is precious little of the fascinating recording process- and you may or may not agree with this, but the speaking is overbearing when it comes to how little of the actual process of recording the album is on screen and she'll talk about a song for four minutes and then you see about 30 seconds of the finished product, not while it's being worked on, not while she's in the grand house laying down the glorious vocals. I didn't mean to make any of you feel angry or sarcastic and I hope you love it. that i want to see it a 2nd time means i don't hate it, not at all. It just isn't what i consider a documentary. But Stevie in a film is thrilling to me. I was spellbound by her speaking, for all of my life, until about in the past decade. She repeats herself a lot, the Bob Dylan story, for one- and there aren't any new ''stories'' -she rather drones, and it isn't magical listening to her, in the film. But I know what you all mean. Love it, everybody who goes, and maybe one or 2 of you will see the reservations i wrote of, but it doesn't matter. Stevie's coming soon in a movie theater near YOU! Definitely worth seeing, maybe I failed to convey that.